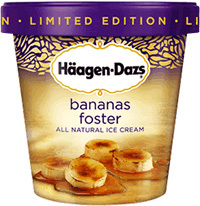 I saw this in the store, but didn’t buy it because I was also afraid the banana would taste artificial. I remember that sticky toffee pudding ice cream, I was allowed to eat a lot of it when they had it because I was trying to gain weight, it was delicious! You have a very nice and yummy blog!